Been there, read that, bought the t-shirt...or made the t-shirt, at least! 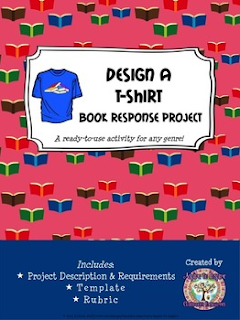 With this fun and creative book report alternative, students will design a t-shirt based on important scenes or characters from a book that they have read. READY TO USE--JUST ADD T-SHIRT & FABRIC PAINT! This VERSATILE project can be used with any genre of book. Assessment of the project is EASY with a rubric designed for you to develop your own evaluation scale based on the requirements of the project. WANT MORE CREATIVE BOOK RESPONSE PROJECT OPTIONS LIKE THIS ONE? Turn book reports from drab to FAB! You can find this project plus 29 other READY-TO-USE creative alternatives to the traditional book report in Not Your Grandma's Book Report: 30 Creative Ways to Respond to Literature. This bundle of 30 projects includes everything students need to show what they know about what they've read! SOMETHING FOR EVERYONE! Creativity, choice, and multiple intelligences are all emphasized in these reading response projects for all abilities, interests, and genres! They are also aligned with many Reading and Writing Common Core standards for grades 3-8. SO EASY TO USE! With more than 150 pages of materials, this product is organized by project, and elements are uniform in look, layout, and language. Project descriptions, graphic organizers, final templates, and rubrics are distinguished from one another by specific page frames and uniform page headings. SO EASY TO ASSESS! Rubrics are specific to the projects but allow for you to develop your own evaluation scale. GREAT VALUE, GREAT QUALITY! At 50 cents per project and 150+ pages of resources, you're getting not only great value but also a comprehensive, organized and thoughtfully prepared product that frees up your valuable prep time. One-time investment = years of use! INCORPORATE CREATIVE RESPONSE PROJECTS LIKE THIS ONE INTO A LARGER ELA PROJECT! Looking to replace traditional book reports with a comprehensive language arts project? I invite you to check out my BIG ELA Book Report Project FULL VERSION! The BIG ELA Book Report Project turns a traditional book report into a truly comprehensive language arts activity using a combination of reading, writing, speaking, and listening tasks. Each part of this project is aligned with an ELA Common Core standard. --Reading: Students read a book of their choice from a specified genre. Then, they demonstrate comprehension and higher-level thinking by completing two response projects from the Not Your Grandma's Book Report list. --Writing: Students also demonstrate comprehension by completing a genre-specific handout that requires knowledge of the setting, characters, plot, problem, and solution. Students are also asked to relate the book to themselves with opinion questions that require support from the book. --Speaking: Students use their knowledge of the book and opinions with support to prepare and give a 3-5 minute book talk to persuade classmates to read the book. -Listening: Students demonstrate active listening skills by completing a feedback form for each book talk. Students write down details from each book talk and evaluate whether they would like to read the book in the future. Your questions are welcome, and your feedback is appreciated! (http://www.teacherspayteachers.com/store/aspire-to-inspire). As such, it is for use in one classroom only. You may purchase additional licenses for additional users at my store. This item is also bound by copyright laws. Redistributing, editing beyond the needs of your classroom, selling, or posting this item (or any part thereof) on the Internet are all strictly prohibited without first gaining permission from the author. Violations are subject to the penalties of the Digital Millennium Copyright Act. Please contact me if you wish to be granted special permissions. Thank you for your compliance!